A new method has been developed to make drugs 'smarter' using nanotechnology so they will be more effective at reaching their target. Scientists from the University of Lincoln, UK, have devised a new technique to 'decorate' gold nanoparticles with a protein of choice so they can be used to tailor drug to more accurately target an area on the body, such as a cancer tumour. The nanoparticles can 'adsorb' (hold on its surface) drugs which would otherwise become insoluble or quickly degrade in the blood stream, and due to their small size they can overcome biological barriers such as membranes, skin and the small intestine which would usually prevent the drug from reaching its target. The technology is already used in real world applications such as pregnancy tests - where gold nanoparticles decorated with an antibody against the hormone present in the urine of pregnant women is added to the 'positive' strip so it reacts with the nanoparticles to turn the stick red - but is not yet widely used in drug development. Until now the process of coating the nanoparticles meant that the proteins used had to be 'mixed' together with particles which do not have the ability to control the way they bind, possibly making the drug less effective. The new method enables pharmacologists to place the proteins onto the gold nanoparticles layer by layer in a specific order. This maintains the integrity of the protein so that the drug is more effective, opening up possibilities for the development of nanomedicine. Dr Enrico Ferrari, a nanobiotechnologist from the University of Lincoln's School of Life Sciences, led the study. He said: "Gold nanoparticles are a vital tool in new drug development and drug delivery systems. We have unlocked the key to binding proteins and molecules so that those drugs will be more effective. "This method might help to design nanomedicines that do not need extensive chemical modification of a protein drug or a nano-carrier and therefore can be developed more easily and faster." 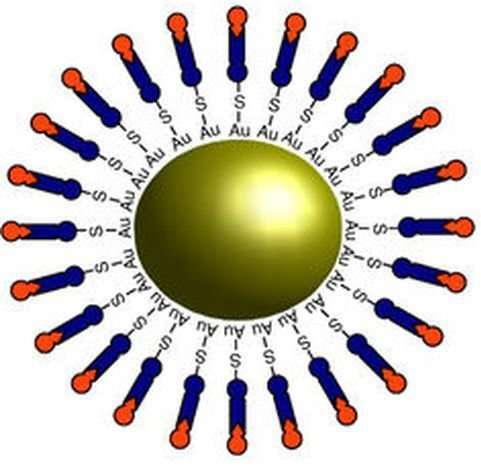 By mixing this fusion protein with gold nanoparticles, it permanently binds to the gold surface while also being able to stably bind a target protein on which a specific 'tag' was included. This is a new universal method to bind proteins to nanoparticles which will work for most proteins, making the process a more attractive prospect for pharmaceutical companies, the researchers said. The method could also potentially be applied to biosensors and diagnostic kits that use gold, such as those used in clinical settings to identify ongoing infections in patients' blood.